Apart from Teutonic castles, the monastic state of the German German House of St. Mary in Jerusalem held other castles, associated with the legal and material status of the ecclesiastical dioceses. The division of lands between the Order and the bishops and cathedral chapters took place in 1243. 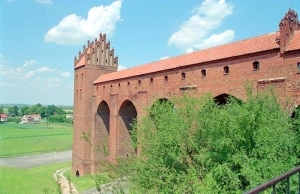 There were two separate castles in Kwidzyn - one which belonged to the bishop (called in German Altschloesschen) and the other one, owned by the chapter, which, together with the cathedral, formed a fortified compound. 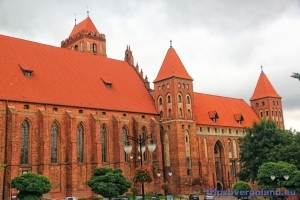 The castle of the cathedral chapter was located in the north-west part of the town. 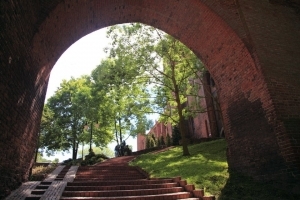 It was built in the Gothic style, of brick laid on a stone base. 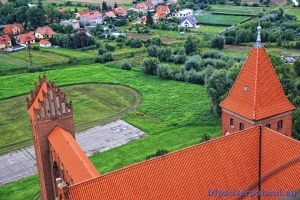 The construction works went on from 1300 to 1330. 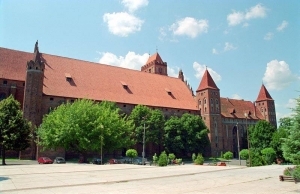 The plan of the castle was typical of Teutonic strongholds and represented the type of a convent house, which consisted of a regular quadrangle with an inner court. The castle wings were fortified with square towers raised in each corner. The state rooms were located on the first floor of the east wing and included an infirmary (a hospital) and, most probably, the apartment of the provost (the head of the cathedral chapter). The same wing held the chapter's archives and treasury. The south wing, which was the longest and the broadest, housed the chapter room and the summer refectory as well as the library and the rooms for scholars from the cathedral school. The west wing contained the dormitory (bedroom) and was connected with the gardrobe tower. The north wing held a small chapel and the winter refectory. The ground floor of the north wing still contains a medieval stove, which served for heating the castle. The ground floor also comprised a number of service rooms, such as a store for firewood, food store rooms, kitchens, bakeries, and pantries. All the farm buildings which served the castle, such as stables and barns, together with a brewery and a garden, lay in the area in front of the castle, known as the forecastle. 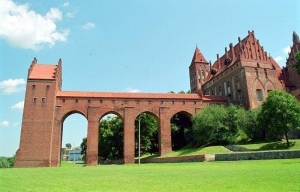 In the second half of the 14th century the finishing works in the castle were completed and the cathedral was joined with the east wing of the castle. The castle builders continued work on the gardrobe and well towers as well as on a monumental belfry, which connected the cathedral and the castle. 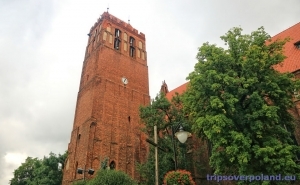 The castle of the Pomesania cathedral chapter in Kwidzyn has the most impressive gardrobe tower among all Teutonic and bishop's castles in the former state of the Teutonic Knights. The gardrobe tower was raised on a square plan at a distance of 54 m from the west wing of the castle. 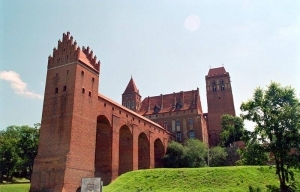 It is connected with the castle by a roofed arcaded bridge, which stands on five massive pillars. 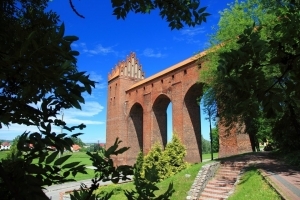 In the past, there was a stream which was flowing under the tower, possibly a branch river of the Vistula or the Stary Nogat rivers. 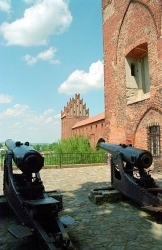 In the centuries which followed the castle was damaged and reconstructed several times. The members of the Pomesania chapter lived in the castle until the Reformation. 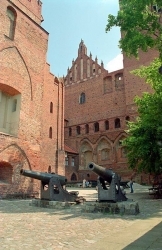 Once the Order of the Teutonic Knights had been secularised, the castle was overtaken by protestant bishops, who lived here until the mid-16th century. Later the castle was ceded to the Prussian Duke, Albrecht. On his behalf the castle was run by head administrators of the regional district (powiat). The castle interiors were adapted to serve as apartments for ducal administration officials. 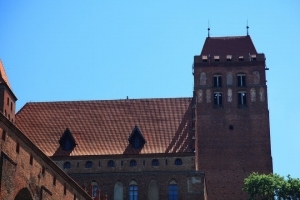 Following the first partition of Poland (1772), the south and west wings of the castle housed the Higher Ducal and Land Court of Justice. The refurbishment works which had been completed then changed the layout of the rooms and corridors. In 1798 the Prussian authorities undertook an unfortunate decision to pull down the south and east wings of the castle. The brick obtained from the demolition was used to construct a new seat for the Court of Justice of the so-called West Prussian Regency. 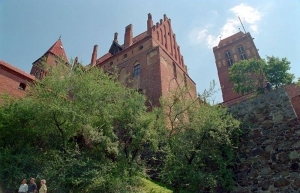 The castle was a seat of administration until 1935. From 1935 to 1945 it housed a school and an educational centre for Hitler Youths. 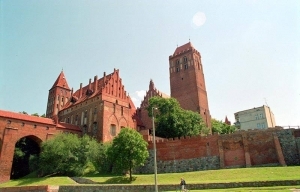 In 1945 the castle building was ceded to the Ministry of Culture and Arts. 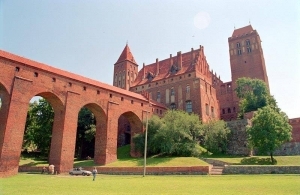 Following some repairs, in 1950 Kwidzyn Castle became a seat of a museum. 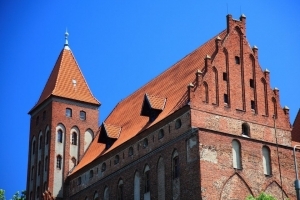 The collections of the Museum comprise material objects representing the culture of Dolne Powiśle, the land lying along the right banks of the Lower Vistula river, including Kwidzyn, Sztum and Susz regions.